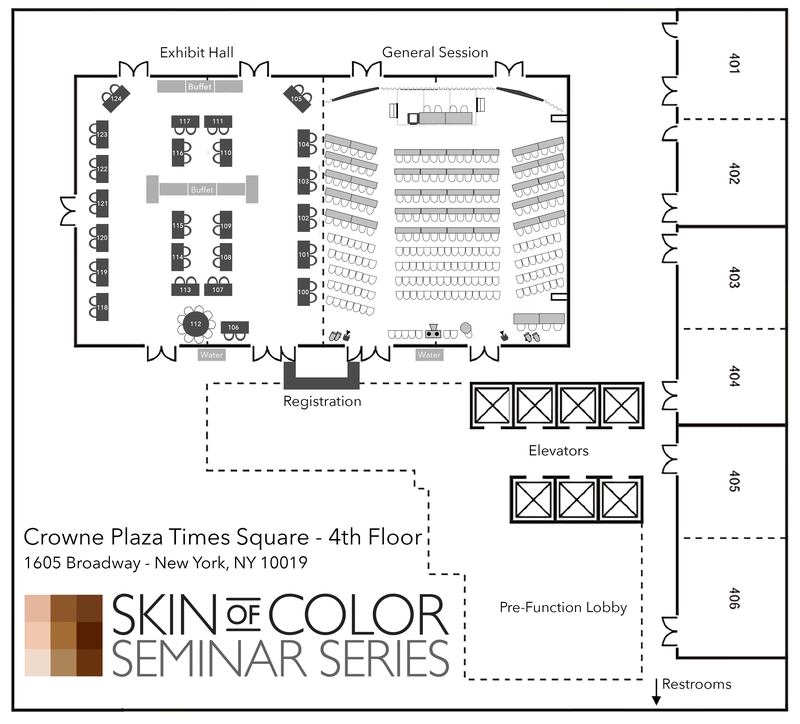 Thank you for supporting the 2018 Skin of Color Seminar Series! We look forward to welcoming you to New York City. Please review the important deadlines below along with instructions for submitting required materials. If materials are not received by the deadlines below, SOCSS cannot guarantee inclusion in onsite materials. The conference room rate is available until April 13th or until the block sells out. The deadline to RSVP to the faculty dinner has passed. Please contact us with questions. To reserve lead retrieval for your kiosk, complete the form below. If a reg bag insert, hands-on cosmeceutical session sample, chemical peel demonstration and/or a room drop was included with your sponsorship, submit the name of the product or flyer you will be including as well as the tracking information. Please send enough items for 275 registration bags and 250 cosmeceutical session full or sample size products. Please send enough room drop materials for 80 rooms. IMPORTANT – Use the shipping address below. Please fill out the attached label, and secure to all boxes being directed to Show Management. Label MUST be attached to box in order for materials to be included bags or sessions. All material MUST arrive between April 30th 2018 and May 2nd, 2018. Exhibitor is responsible for all charges incurred from the hotel for package shipping and receiving, including all items shipped to Show Management. IMPORTANT – Packages that contain an item for the registration bags, cosmeceutical session, or chemical peels session should NOT be sent using this information. For information regarding those shipments, please reference the appropriate shipping instructions to the left. Exhibitor is responsible for all charges incurred from the hotel for package shipping and receiving. Please fill out and return the following credit card authorization form to the Crowne Plaza for all shipping and material handling fees. Exhibitor materials will not be delivered to the booth unless the following credit card authorization form has been submitted by fax to the Crowne Plaza by May 2nd, 2018. Please see the below material handling fee list.